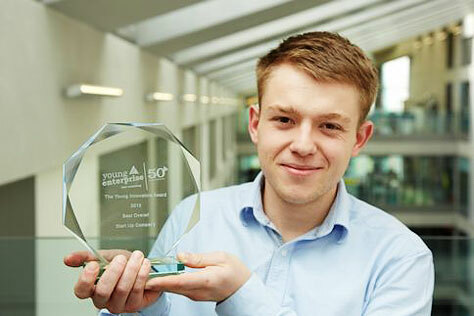 A COMPANY started by a Manchester Metropolitan University business student has won a national Young Innovators Start Up award. Gamespace, conceived by third year Business Enterprise student Matthew Wright, was named best start up company at the awards in London last week. Matt, 21 and from Northwich, started the company selling new and second-hand computer games and electronic equipment two years ago during his degree in the Business School. Thanks to hard work, enthusiasm and a little encouragement from his tutors he is already on track to turn over a six-figure income next year. Matt said: “This is my first business and I never expected it to get so big. It’s great to win and be recognised for the effort I’ve put into Gamespace. “It’s difficult running a business on my own as you don’t really get much recognition or feedback from people. But my degree and the staff at MMU have given me more confidence to make Gamespace an established business. After sourcing secondhand, chart-ranked computer games and quality, used electrical equipment, Matt sells them under the name ‘Gamespace’ on Amazon and Ebay. Matt also received support from Innospace, MMU's business incubator. Senior Lecturer Madeleine Jarvis, said: “I taught Matt on the Ideas, Creativity and Entrepreneurship module. I think he would have been successful whatever happened, but I hope we gave him some structure for running his business and a focus for his ambition. Manchester-themed T-shirt company City of Glory and unique craft jewellery outfit Quirky Charms, both also from Manchester Metropolitan University, were also selected for the finals. David Taylor, Principal Lecturer in Entrepreneurship, said: "Next year we will break records with 140 students launching businesses as part of their final year studies. We are very excited by the challenge of supporting these businesses and linking these nascent entrepreneurs to the wider business community." For more information on the Young Enterprise and Young Innovator schemes go to www.young-enterprise.org.uk.